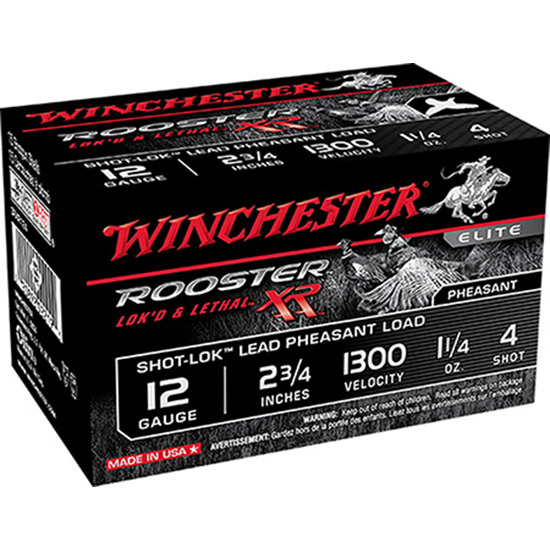 Winchester Ammo SRXR1236 Rooster XR 12 Gauge 3 1-1|2 oz 6 Shot 15 Bx| 10 Cs in. Upland hunters rely on longrange lethality when it comes to flushing ringnecks. Rooster XR features the same ShotLok Technology found in Winchester Long Beard XR which delivers more consistent and tighter patterns at longer ranges deeper penetration and extreme knockdown power. Rooster XR ammunition is ideal for upland hunters who experience challenging shots in tough conditions.